It's my birthday -WOOT WOOT - and I'm proud to admit that I brushed my hair today! Can I get an, "Oh, yeah!" 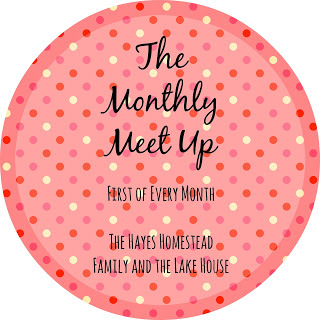 Today, I'm linking up for Five on Friday, as well as mine and Sara's monthly, goal-oriented, link up, The Monthly Meet Up. It's all about some quick snippets into my brain concerning all things, "blogging" this week/month. I need to expand my social media skills. As of right now, Instagram serves as my major way of communicating with other bloggers via social media and I love it! It's a wonderful community. I've reactivated my Facebook, but it'd probably help if I actually posted over there once in a while. ;) So, yeah - I need to get on that. As for Snapchat and Twitter...I have no idea how to use them. Who out there is using these two forms of social media? Do you like it? What should I be doing? Should I be involved in other forms of social media at all? Tell me your secrets! Spill the beans, peeps! Trying to find time to blog is difficult. It's a hit or miss on naptime over here, which used to be "the time" to blog. Even if we attempt "quiet time," the kids aren't quite grasping the concept of staying in their bedrooms for longer than fifteen/twenty minutes tops. Usually a fashion show ensues by Miss. E and Henry is heard saying, "Ta-da!" The fashion show then usually turns into one without clothes. Yup. Eliza gets down to her birthday suit and then she usually does some sort of booty dance. I'd like to think of this blog as a personal journal, but also as a place where friends, family and strangers can come and get inspired. I think it's fun to share our daily lives, it keeps it real, but I have a huuuuge passion for all things home decor, as well. As I was explaining to Jon, our home has walls with nothing on them and as much as I'd like to decorate the entire house in a weekend - that's impossible. Making a house a home takes time and how fun would it be to share the journey? It's not bad, but it's certainly not great. I love the design. It's my pages and archives that need work. We all know about this one, don't we? Trying to stay yourself when everyone wants to be - from a design standpoint - some form of Joanna Gaines (love her), Genevieve Gorder, Candice Olson (one of the best) or Vern Yip, not mention the various other amazing bloggers and Instagrammers. Most people want Pinterest-y homes, well-dressed children and designer clothes. But you know what? Our home was built in the 70's, it has a creepy crawl space and we've had mice. Sure, we've renovated, and believe me, it took lots of blood, sweat and tears. Literally. We've made our home new again, but it gets messy, it gets dirty, there are legos everywhere, socks down the hallway and dirty dishes in the sink. In the midst of all the "perfection" floating around the wonderful World Wide Web, it's important to show the "imperfect perfection" that of which is our home, our lives and our kids. You may see Henry wearing a cute shirt from Zulily and Eliza sporting some Matilda Jane on IG, but in reality...most of their clothes are hand-me-downs and most others were purchased at the grocery store, cute, but not designer...and that's okay. On that note. Thanks for stopping by! 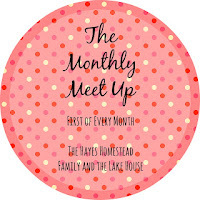 I'm linking up with Sara for The Monthly Meet Up linky party! I love real bloggers WAY more than the perfect Pinterest ones!!!! I can't wait to read your posts, I hope you can post more!!! I use the early morning hours, and after bedtime hours.. not awesome for sleep, but it helps. And Twitter??? No idea how it works. none. I kinda sorta Tweet but am still super confused about it. Thanks and I hope so, too! Okay, that's it...I'm going to try and wake up early next week...try....maybe...eh, we'll see... See how I just talked myself out of it?! What's wrong with me? Haha! I love this and I love seeing more of your personality!!! You're hilarious and adorable! 'quiet time' is lost on my toddler... thank GOD my 8 month old naps or I'd be in an asylum... kidding... no, no I'm not. You know that I love your blog, Marie! You were one of my first blogging buds and I'd follow your blog to the ends of the earth! Keep on keeping on, Momma! Awww... thanks, babe! Right back at ya'!